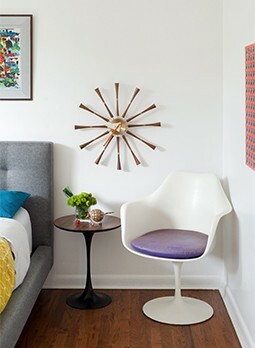 As midcentury style becomes popular again, more companies are catering their designs to attract modernist enthusiasts. There are so many great new pieces out there with a retro vibe—and let’s face it, some of those iconic original pieces can be hard to find. Especially for sofas and arm chairs, which have often become damaged beyond repair over the years, new items are a good alternative. In his living room, Chris displays a blend of both new and vintage pieces. The walnut sofa and chair are custom from Futurama, and the coffee table is from Design Within Reach. The entertainment station, a George Nelson piece, is vintage. Usually, the name of the game with midcentury style is to replicate every aspect of a modernist home exactly, down to the last detail. This means using each vintage piece in the same way it was used originally. But that doesn’t have to be the case. You can use a neat old piece in a new way to fit the needs of your space or your activities. In the Bonds’ Palm Springs home, Chris found a vintage George Nelson filing cabinet, made for Herman Miller, and had to have it. But he didn’t need a filing cabinet—he needed an entertainment center. The piece looks great in the retro living room, contributing to the authentic midcentury feel while also serving a functional purpose. If you fall in love with a piece online or at a flea market but can’t use it as it was originally intended, get it anyway and see where you might be able to upcycle it. Want to see the rest of the Chris Bond house? 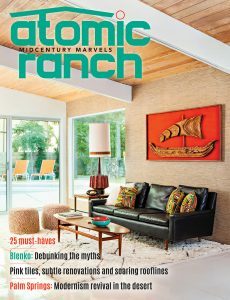 Pick up a copy of the spring 2017 issue of Atomic Ranch, on sale now!